Wiki Biography: English actor, writer and comedian Simon Pegg is the son of a jazz musician father and a civil servant mother. His parents divorced when Pegg was seven. He was educated at Brockworth Comprehensive Secondary School in Gloucestershire and went on to Stratford-upon-Avon College to study English literature and performance studies. He then attended the University of Bristol, and earned a bachelor's degree in drama. 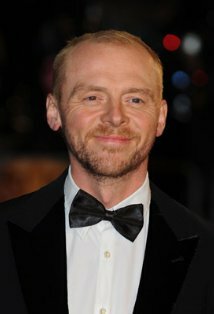 In the early 1990s, Pegg moved to London and began forging a successful career in stand-up comedy. Television opportunities followed including roles in "Six Pairs of Pants" (1995), "Asylum" (1996) and "We Know Where You Live" (1997). In 1999, Pegg and Jessica Hynes teamed up to write and star in cult sitcom "Spaced" (1999), directed by Edgar Wright. The series also featured Pegg's best friend, Nick Frost. Pegg's breakthrough in film came with the zom-rom-com Shaun of the Dead (2004), which he also co-wrote with director Edgar Wright. Again, the film featured Nick Frost. The trio also scored a hit with police comedy Hot Fuzz (2007). Further film successes followed for Pegg, notably in the iconic role of Montgomery "Scotty" Scott in Star Trek (2009) and alongside Tom Cruise in Mission: Impossible III (2006) and Mission: Impossible - Ghost Protocol (2011).